Here is a recording of an interview I did with Charlie Brown for his “Life and Technology” show. This was aired on Radio 2GB on Saturday 9th August 2014. This conversation was about two distinct topics – the challenges of starting a company in Australia and also about electric cars in this country. You can also read more about Tesla and their cars – with some more thoughts from me as well on that topic, at the cybershack web site. This post just points out a couple of places on the Interwebs where I’ve discussed the journey around starting, growing, and ultimately selling Internode. Back on November 27th 2013, I found myself with a speaking role in a live performance event. 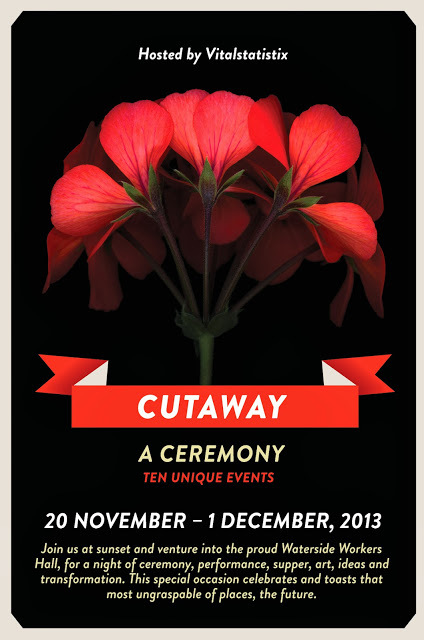 The event was called “Cutaway – a Ceremony“, and it was held at the home of the Vitalstatistix Theatre Company in historic Port Adelaide. The over-arching theme was about ‘being a good ancestor’ – in other words, it was about the process of considering how each of us can choose to find their own way to leave society a little better through their efforts. Well, here’s a bit of a blast from the past. I came across a couple of recordings of short TV programs aired back in 2002 about Agile and Internode. The second one is about Internode, again aired in 2002. There are a lot of long term, wonderful Internodians in this video. Many of us had significantly more hair. Its amazing to me to see the old monitors – the old huge monitors – and to be reminded how much desk space those things took up. We had already come such a long way in 2002, from humble beginnings in 1991. The building this was filmed in was our York St, Adelaide, office, a small laneway in Adelaide’s ‘East End’. That building no longer exists – it was knocked down in favour of residential apartments many years back.